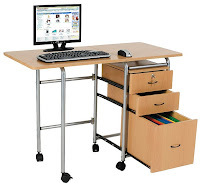 can i handle a mobile office? i'm beginning to ponder my transition from digital-gadget-collector-with-plenty-of-room to recovering-digital-gadget-collector-who-has-little-room-but-still-needs-to-work. a mobile office will be challenging i'm sure. 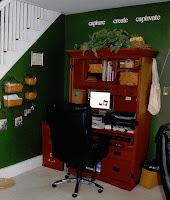 i'm used to working on a laptop, but i always had a docking station and a nifty armoire with everything i need within reach (not to mention a warehouse full of gadgets!). multiple printers, external drives, phones, fax, cameras, chargers, mouse, tablet, keyboard, usb cables for everything, thumb drives, sd cards, card readers, drawers, files, pull-out counters, etc. even extra computers, desktops, laptops, mac, and pc! now i need to condense all that into a shoebox. hmm, this could get interesting. 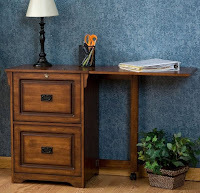 i'm looking at desks that fold up into file-cabinet-sized, well, file cabinets, for storing as we travel. fortunately we'll be parked more than we'll be driving, but still, it's a bit perplexing how this will work. precious few RVs with bunks for the kids have desks. apparently it's not so common for families of 5 to live and work on the road. whatever, i need a desk! but alas, my desk may be small and on wheels. i just hope i can sneak most of my gadgets past allen! hmmm not sure what ur rv set up is like wonder if u can convert a space to drop down like a shelf or something. 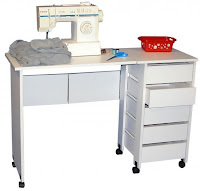 or if you get that fifth wheeler you could could take out the washer/dryer and make a custom work station - with a fold out desk like the old ironing boards. Then you would have to use laudramats, but doing laundry as a family in laundrimats across the country could be fun -- phot opportunities and blog material -- you can meet really interesting people at laundrymats. How the heck do you spell laundremat anyway? A word for an upcomming spelling lesson for your kids I think. check ikea for ideas too!! They really know how to maximize small spaces. I just cannot wait to see what you figure out.